Among the areas Columbus discovered during his second voyage (1493-96), the Virgin Islands and Puerto Rico are the oldest American possessions in the historical patrimony of the United States. 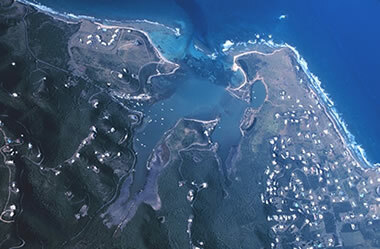 Salt River Bay near Christiansted National Historic Site is associated with Columbus' discovery of Isla Santa Cruz (St. Croix) on November 1, 1493. There, a party of Columbus' men returning from explorations ashore attacked a group of Caribs in a canoe. The encounter is believed to be the second armed conflict between Europeans and Native Americans, the first being the battle fought at La Navidad on Española by Columbus' men, who spent a year there after the wreck of the Santa María in December 1492. In that encounter, the natives nearly wiped out the Spaniards. In 1509, Juan Ponce de León, first governor of Puerto Rico, negotiated a treaty with the Caribs on St. Croix with intentions of securing their cooperation in providing agricultural produce. A Spanish ship's crew breached the good will when they attempted to enslave a group of Caribs and triggered a war that spread throughout the Antilles. The Spanish attack on the Caribs on St. Croix began their gradual abandonment of the island by 1600. In the next two centuries, other European powers occupied it. Before establishing mainland colonies, Spain first settled the larger Caribbean islands--Española, Puerto Rico, Jamaica, and Cuba. In 1508, Juan Ponce de León re-explored Puerto Rico and within a year obtained a patent for the conquest and settlement of the island. In 1511, he laid the foundations for the establishment of San Juan, one of the oldest European cities in the Americas. Two years later, however, relieved of his governorship, Ponce de León embarked on another quest for fame and riches in Florida. The Spanish formally established San Juan, Puerto Rico in 1521, ten years after establishing themselves on the island. 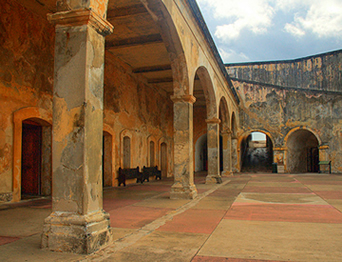 The historic district of San Juan represents one of the longest colonial periods in the Western Hemisphere, for the Spanish claim to the island extended from 1493 to 1898. The Spanish constructed the massive coastal fortifications of San Juan to repel European invaders during the age of sail. In the Spanish-American War of 1898, steam-propelled vessels from the United States captured the island and Puerto Rico became one of its territorial possessions.